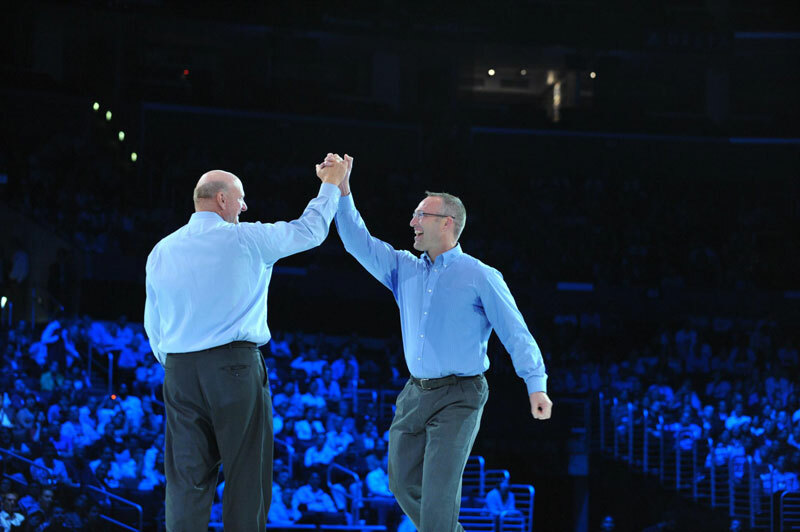 I spent a good part of this week at Microsoft's Worldwide Partner Conference (WPC) in Los Angeles, and I came away with this thought: in enterprise IT, Microsoft is turning into one of the "good guys." First, let's turn back the clock. Around the turn of the last century, Microsoft had a lock on personal computing, especially with its Windows desktop OS and its Office productivity suite. Apple was in a far distant second place. Netscape had a head start with a Web browser but was soon crushed by Microsoft's Internet Explorer. Linux made inroads at the server level but never gained traction on the desktop. Microsoft on the desktop was like IBM in the data center in the 1980s. It was commonly said, whatever market Microsoft chooses to go after, it will soon dominate. The US Department of Justice and European Union pursued Microsoft on antitrust grounds, like the US did with IBM years before. But these actions seemed to do little to slow Microsoft's momentum. But, what a difference a decade makes. The desktop is rapidly losing ground as the center of personal computing. Smartphones and tablet computer usage are exploding, and Microsoft has a tiny market share on both. Apple still has a small market share for desktops, especially in the enterprise, but it is now the choice for all the "cool kids." Microsoft still has a majority and growing share of the workload in corporate data centers (over half, even in large organizations, per our research at Computer Economics), but it is late to the game in cloud computing, which threatens the very reason-to-be for corporate data centers, long-term. Its search engine, Bing, has some interesting technology, but faces an uphill battle against Google, which dominates the search ad business. Therefore, in many markets, Microsoft is the underdog. "Now the old king is dead, long live the king!" There were signs of humility in the keynotes, such as Steve Ballmer remarking that the market share of Windows Phone had gone "from very small to very small." Even in touting success, such as with the roll-out of Windows 7 and Office 2010, there was none of the bluster we too-often see from certain enterprise vendors. Ballmer even had a hard time getting the partner audience to give a good hiss at the mention of a competitor. So, as I'm listening to keynotes and conducting one-on-one interviews with Microsoft executives and partners, I'm getting the feeling that Microsoft is losing its place as everyone's favorite punching bag. In fact, it has a real opportunity to be the good guys in the enterprise IT marketplace. I see this in three ways. Microsoft takes a lot of criticism for its proprietary technologies--especially from open source advocates (of which, I am one). I still believe that open source technologies, such as Linux, AJAX, and others, are a great foundation for building enterprise software. But, increasingly, independent software vendors (ISVs) are seeing Microsoft as another safe alternative. It is not generally known, for example, that SAP--the granddaddy of enterprise software--is using Microsoft Visual Studios as the platform for scripting custom logic in its new Business ByDesign (ByD) cloud-based ERP system. SAP formerly did nearly all development in its proprietary ABAP language as well as in Java. But now, SAP apparently feels that Microsoft's C# is a better choice, at least for ByD. When I asked SAP about this a few months ago, an SAP executive told me, it's because most of the target market for ByD--small business--is already using Microsoft technologies. This week, at the WPC, I ran into an executive of a Tier II ERP vendor, which competes with Microsoft Dynamics. I was surprised to see him at a Microsoft event. Why was he here, I asked. "Because, we're a Microsoft partner," he replied. "We use .NET, Lync, Sharepoint, and Microsoft's business intelligence capabilities as part of our product strategy. We're also using Azure to build cloud-based mobility apps." Later in my one-on-one interviews with Microsoft executives, I asked about this. How can you compete with these enterprise software vendors in your Dynamics business, yet turn around and support them with your technology? The answer, in so many words, is that in the big picture, Microsoft will be more successful by being a safe platform provider for other vendors, than it will be by hoarding its technologies only for use by its own applications business. So, at a time when other enterprise software vendors are questioning their commitment to Java, in light of Oracle's acquisition of Sun, Microsoft is starting to look like one of the good guys. Despite Steve Ballmer's talk about being "all in with the cloud," Microsoft's actual progress has been slow. From this perspective, Microsoft is seen as a laggard, falling behind cloud infrastructure providers such as Amazon, as well as SaaS providers, such as Salesforce.com and NetSuite. This has been my view for some time, and I still feel this way. But from interviews with Dynamics executives, it's clear that there is some deep thinking going on about the cloud. Specifically, what is the value of cloud computing to customers? Is it only in cost-savings through outsourcing the infrastructure to a low-cost platform? Is it with all workloads equally, or with certain workloads? Are there parts of the enterprise suite that customers will more likely want to retain in-house, or with a trusted third party hosting provider, while moving other parts to a shared multi-tenant environment? What scenarios favor multi-tenant as the preferred architecture, due to the relationship between the tenants? With many enterprise IT vendors today, where you stand on the cloud depends on where you sit. If you are a NetSuite or Salesforce.com, the only valid strategy is to have everything delivered as a pure multi-tenant SaaS offering. If you are a Larry Ellison, SaaS is a myth, or if you are a Harry Debes, the SaaS industry will collapse in two years. But, with Microsoft there's no such dogmatism. Rather, it is thinking hard about where customers find the most value in cloud computing and is working to prioritize its migration to the cloud to focus on those value propositions. I just wish they would get there faster. The third way in which Microsoft is the good guy is in the opportunity it offers to entrepreneurs. We all know that Microsoft's sells a lot of products to small and mid-size businesses. But Microsoft is also small-business-friendly in its partner channel. Attending the WPC is a real eye-opener: thousands of partners, mostly small businesses, many entrepreneurial, enabled by Microsoft's channel program. During these economic times, when everyone is championing small business as the key to economic prosperity, Microsoft is enabling thousands of entrepreneurs and small businesses worldwide to grow and compete successfully. In fact, IDC recently estimated the total 2010 revenue of the Microsoft partner ecosystem at US $580 billion. Compare that to Microsoft's revenue of approximately $60B, and you can see that every dollar Microsoft makes results in about 8 or 9 dollars of revenue for its partners. That's a big opportunity for Microsoft's 640,000 partners worldwide. My interviews with three Microsoft partners also gave me insight into how these small businesses are winning in these difficult times. I interviewed Jeff Geisler, owner of Socius, a traditional CPA-type partner, which is growing steadily through the recession by acquiring smaller firms. I also met with Steve Thompson and Jim Sheehan from PowerObjects, a Microsoft CRM partner with strong development capabilities. Finally, I had a sit-down with Paul Tilling and Bob Hadingham at LexisNexis. Paul and Bob's group is an independent software developer in the UK that has taken its software for law firm practice management and is migrating it to Dynamics AX as its underlying platform. These three businesses have different focuses, but each is betting its business on Microsoft's partner channel. With some other enterprise IT vendors, being a partner is a risky bet, as you sometimes find yourself competing against the vendor's direct sales force. Or, the vendor has a shifting strategy on where it wants to allow its partners to do business. Microsoft, by running 95% of its revenue through the channel, has no such conflict. The choice of venue--Los Angeles--was entirely suiting to this theme. The city has seen hard times over the past several years. The glow is off the Golden State. The land of opportunity has been slow to recover from the recession. Our state budget is deep in the red and the business climate is going from bad to worse. It's a microcosm of most of the nation. Microsoft could have chosen San Francisco or Silicon Valley, where it would have been just one more tech conference. Instead, it chose Los Angeles, where it could make a difference. In fact, I'm told, this was the largest business conference ever in Los Angeles, and was estimated to bring $45 million for local businesses. So, once again, Microsoft is the good guy. Frank - good assessment ... thanks for passing along. I'm from a cloud ERP player using Microsoft technology and all 3 points apply to us. BTW, the feedback was overwhelmingly negative on LA as the host city. Thanks, on both comments. Regarding LA as the host city, I wouldn't disagree that it was not the best venue as far as the conference experience goes, only that it was certainly good for the city. As you write yourself for very dollar MS makes 8 or 9 dollar is made in the channel (mainly services). If i were a MS shareholder, that would hurt, especially when Microsoft would stop growing and would need to find new sources of revenue. Today, what is Office365 if not a first step in taking a small piece of the Partner's pie ? @lemarco, thank you. I do not believe Microsoft launched Office365 as a way of cutting partners out of the revenue stream, although some (or many) partners see it that way. The world is changing, and many customers are seeing cloud services as a simpler and cheaper approach than, say, installing Exchange on-premise or even as a hosted solution. Microsoft has to have something like Office365. The question is, how can partners continue to make money in the new world? Despite the many benefits of SaaS, I think On Premise still has a good run ahead of it. Doug's link has a succinct summary of both options, below. Lower ongoing cost is debatable, but in principle the buy versus rent concept holds, with the exception maybe that multi-tenant architectures elevate economies-of-scale to the point where ongoing costs might in fact be lower. But whether mult-tenant vendors actually pass on said benefit I am unsure. The scales might tip once startup development costs amortize somewhat - or the number of tenants has risen above a threshold. Aside from consulting services (which itself is large), an alternate source of revenue for partners is to sell and implement ISV apps hosted on Azure - aka PaaS. And rather than try to compete with Dynamics products, ISV apps should try to complement Dynamics. The Core is big but the Edge is huge. Disenfranchised partners who find themselves cut out from license revenue might focus in implementing (as distinct from selling) Dynamics applications and or Office365 applications. @Matt, great feedback as always, and agree fully with your assessment. One point: as long as there is competition among multi-tenant providers, I think you'll see the cost savings associated with multi-tenancy passed along to customers. In addition, IMO, the big benefit from pure SaaS is the great reduction or elimination of periodic version upgrades. The cost and effort required for version upgrades is the biggest reason that many customers wind up stuck on old versions. I like your points on implications for partners. Partners can and should prosper in the move to the cloud, but the world is changing, and partners need to adapt.